If you’re a bride with a specific vision, you’ll need a venue that can mold and transform right before your eyes. When you’ve got a clean palette to work with, you are more apt to be able to get creative and add your own personal touches to the space. 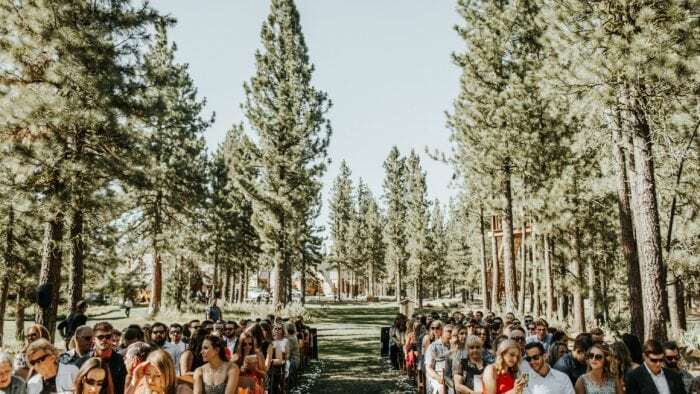 This is especially true if you’ve harnessed a more offbeat or trendy idea that doesn’t necessarily fit our usual choices for weddings like gardens, churches, or even hotel ballrooms. 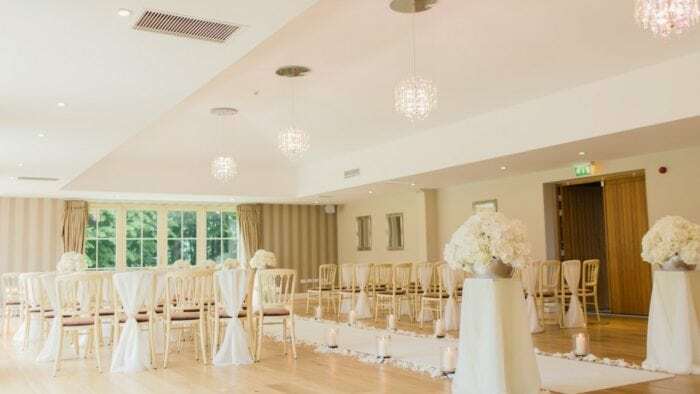 Spots like such as De Luxe Banquet Hall can hold essentially any size wedding while having the ability to be customized to the bride and groom’s particular tastes. Let’s explore all the how’s and why’s banquet halls are the perfect venue for visionary brides to book. Typical banquet halls will be able to fit nearly any size wedding. From extra-large to intimate, these kinds of spaces can bend to your preference. Check out the room size ahead of time and figure out a plan on how to fill the empty space (or cut off sections with beautiful fabric) if you’re looking at a smaller guest count. Banquet halls are known for their crisp, clean palettes. Since there’s not particular style these on their own, you’ll be able to create the magic from ground level up. Whether you’ve decided on a trendy, steampunk party or a winter wonderland escape, being able to have a nice tablet to start with without any outside influences on the decor or transformation. Some banquet hall venues will have inclusions in their price – or at least have really great relationships with other vendors that you’ll need like caterers and florists. 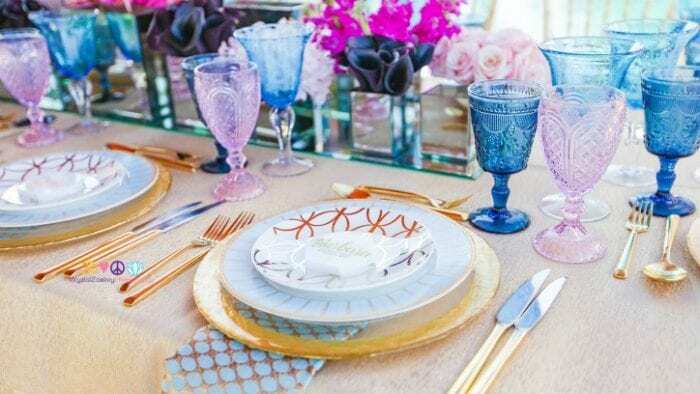 Some special spots will be able to be used for other events as well, like the bridal shower and have in-house caterers or event planners to help with your every wish and whim. A lot of times, the price tag that comes with a banquet hall is quite affordable and respected, especially if there are inclusions or vendor deals involved. Also, if there are package options like other standard venues, you’ll get an awesome deal for a larger amount of people. Location is key to your venue. Thankfully, banquet halls are usually spotted in the best of areas. If you can’t find a spot that fits your vision perfectly, in the city of your choice, we can almost guarantee that there will be one of these crisp spaces nearby to delight your fancy. 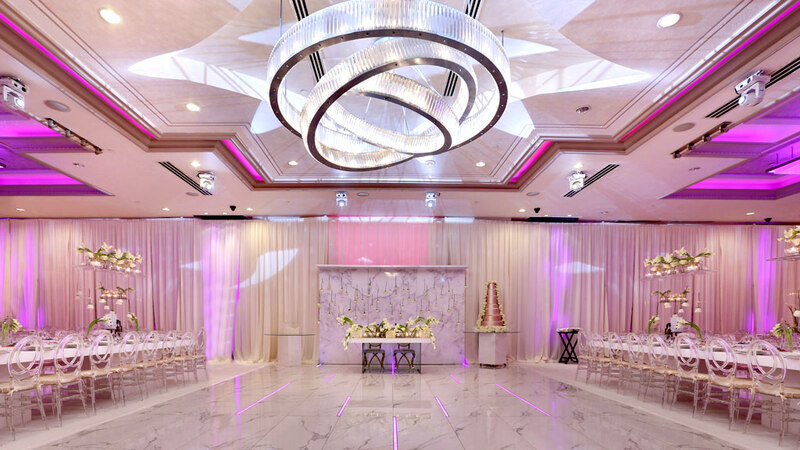 The Deluxe Banquet Hall, located in Los Angeles, is a beautiful example of why banquet halls are such a great option to choose when deciding on a wedding venue. It’s fully customizable and has a full, in-house catering team that rounds out their events completely. This particular banquet hall has a couple of different spots for brides to choose from like the De Luxe Ballroom and the Olivia Event Venue. And this entire establishment is convenient for guests of the city, as its located near hotels for out-of-towners. 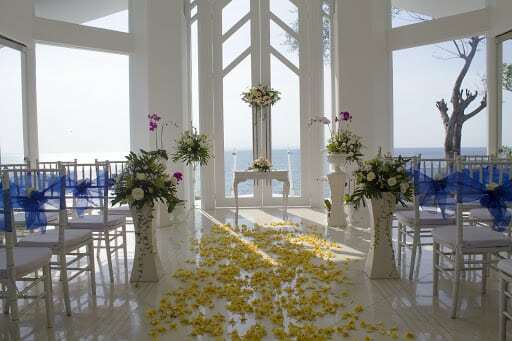 At this space, the bride and groom gets to fully customize their event. From the table and chair arrangements to the walls all the way to the dance floor, it’s theirs to transform.